A control panel is the central nervous system of modern industrial processes and production therefore, it is crucial to effectively manage all moving parts in an industrial control environment. Many facilities do not take full advantage of efficiency, optimization and predictive maintenance regarding their potential automation processes. 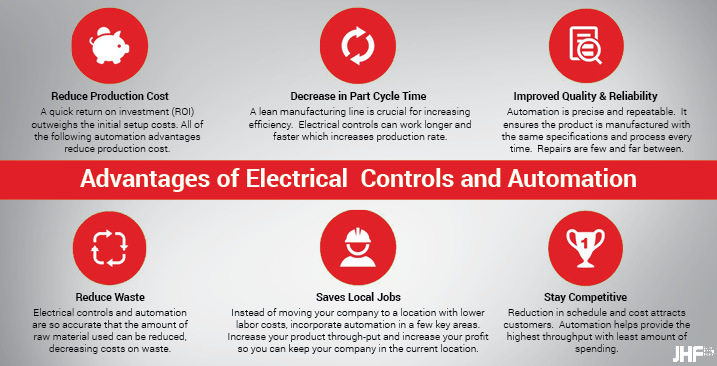 ROI studies show that an electrical control panel is one cost that can be validated since they reveal payback that can be measured in months. JHF’s electrical engineering technicians can work with you to evaluate your Company’s automation and control needs and uncover opportunities that may exist. We also determine the costs associated with incorporating a control panel; helping you calculate future potential return on investment. Our engineer staff offers over 100 years of combined experience that work closely with you through the complete process of project design to installation and continued support on an as needed basis. Contact us today and we’ll look into your current processes and design automation solutions that improve efficiency that directly contributes to profitability.